The third game in the Dragon Age series of games from Bioware, a series that for many thought was in development-hell prior to its official announcement in 2008, Inquisition is soon to be upon us. Once it arrived it received critical and commercial success that resulted in an expansion and a sequel in the form of Dragon Age 2. This was not so well received thanks to the repeated environments and alterations to the combat, which did away with the pause function in favour of a real-time system akin to an action adventure. 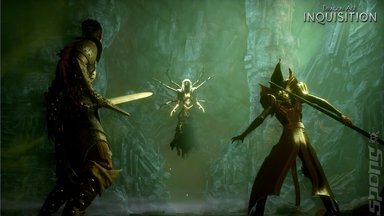 Dragon Age: Inquisition appears to draw from the original title far more, while adding brand new features driven primarily by the story. It is this fact that makes the Dragon Age series stand out, as the design decisions are largely based around how Bioware wants to tell the unfolding story. 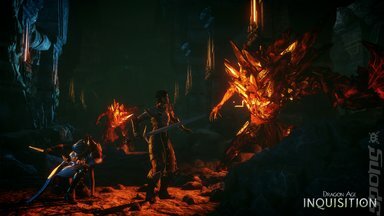 So in the case of Dragon Age: Inquisition the story demanded an open world environment the player had to explore and quest their way across, hence its inclusion. Chris O'Regan, roving reporter at SPOnG.com and host of The Sausage Factory podcast, spoke to Neil Thompson, Bioware art director, at EGX 2014. 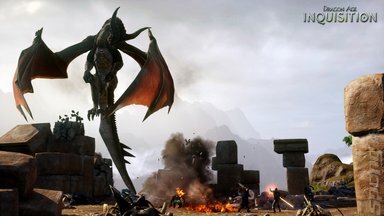 SPOnG: Dragon Age: Inquisition has an open-world environment, what drove Bioware to adopt this model for the third game? 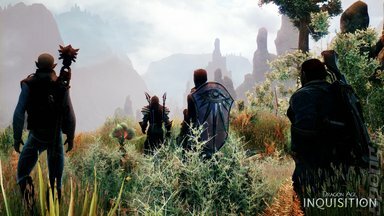 Neil Thompson (NT): The world of Thedas [the realm within which Dragon Age is set] is so rich: there's a lot going on there, a lot of factions, some of them warring. It's a narrative that demands an open world structure and we wanted to reflect that within the environments as well. SPOnG: Is it fair to say that you looked to other titles like Skyrim for inspiration? NT: Not that title specifically no. We take inspiration from many sources including playing games, watching films, reading books all of which goes on to inspire your own creative endeavour. I think the larger environments are a natural evolution from the previous Dragon Age games. SPOnG: So the adoption of an open world has been driven by the story. NT: I think that's Bioware games; that's what they are known for, the strong narrative and I think that's what makes us unique in the industry. SPOnG: Pausing in combat makes a return in Dragon Age: Inquisition, why? NT: It enhances the combat experience. So instead of going in free-for-all by entering into combat and just going for it, you now have the opportunity if the combat is maybe getting a bit challenging for you, you can freeze time. This allows you to approach the combat in a more strategic manner by positioning your party giving them opportunity to impress with their abilities. If nothing else it gives you time to pause and think, which can often be a good thing. You don't have to use it of course, you can go either way with it. The real-time combat is still intact. You can play Dragon Age: Inquisition entirely in third person, it's entirely up to you. I think a blend of the two is the best way of playing through the game. SPOnG: Dragon Age: Inquisition is being released on five platforms: PC, PS4, XBox One, PS3 and Xbox 360. How have you found developing for such a diverse spread? NT: The PC-like architecture of the PS4 and the XBox One has helped us greatly. The real challenge is getting a game out on multiple SKUs. We have 'Gen 3' versions [PS3 and Xbox 360] as well, so the challenge was taking a game that is vast and lush and makes full [use of] what the new generation of hardware [PS4, Xbox One and recent PCs] can produce and you end up making the same experience for the Gen 3 consoles as well. That's a huge challenged that I think we have coped extremely well with. We want to make sure everyone has the same experience no matter what platform they are playing Dragon Age: Inquisition on.